The price of bitcoin has once again crossed $100 at the other large exchanges, according to data at Bitcoincharts.com. BTCe is still offering the lowest US dollar rate for bitcoin, with the last trade at $99, though it too broke above $100 earlier in the day. So with the close exception of BTCe, the top 5 exchanges in US dollar volume—the others are Bitstamp, CampBX, and BitBox—are all trading bitcoin for over $100 currently. 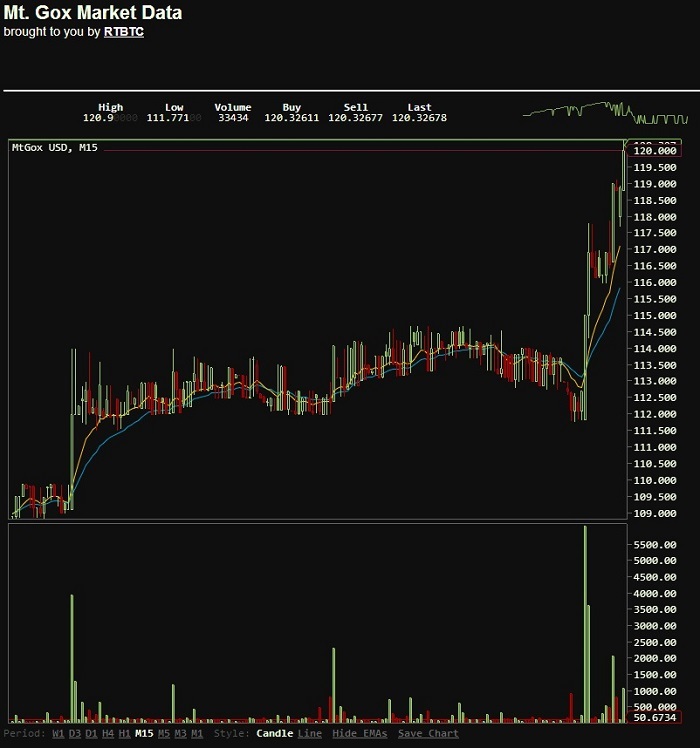 Speculation continues in the Bitcoin forums about whether the very rapid spike in bitcoin’s price at Mt. Gox, which increased 10% in the past 24 hours from $111.77 to $123.74, might be due mainly to concerns about US dollar liquidity issues. Volume remained above 4000 bitcoin for most of the day while the price rose. For example, Mt. Gox customers might be purchasing bitcoin there at elevated rates for the sole purpose of transferring their account value to another exchange. That would explain the ongoing widening of the price differential across exchanges and furthermore an incomplete ability to arbitrage the prices between exchanges. In other words, the potential arbitrage profit is currently stuck in a US dollar balance at Mt. Gox. However, the price rising at other exchanges could be caused by the other side of this potential arbitrage trade by speculators who are willing to hold US dollars at Mt. Gox and bet that eventually those dollars will be available for withdrawal in whole, and the sooner the better for the arbitrageur. Moreover, for some customers who have transferred from Mt. Gox, there may be the additional psychological effect of not wanting to sell immediately at a lower price after having just bought bitcoin at the higher Mt. Gox rate.